3 Chambre Villa w / Pool- balayage vista de l'océan, l'emplacement encore accessibles isolée! Profitez de votre Ocean Vista privée de la terrasse de nos 3 chambres 4 salles de bain villa de bord de mer, à droite "avant out" sur l'eau avec une vue à 180 degrés de haut en bas de la côte. Calme Caye Villa est l'un des cinq villas situées à Caye Villas, une propriété en bord de mer magnifiquement paysagé. La villa est décorée avec goût avec notre collection cueillies à la main du Belize, du Guatemala et d'objets africains et de l'art. Le premier étage se compose de trois chambres et trois salles de bains en-suite. La chambre nord dispose d'une douche en plein air amusant qui peut être utilisé pour rincer l'eau salée au large ou pour la douche à l'extérieur parmi les plantes. Chaque chambre ainsi que la salle de séjour est climatisation individuelle. Le deuxième niveau a une grande salle qui comprend un espace de vie confortable combiné avec une salle à manger et cuisine. La grande salle est décorée avec des peintures originales, des antiquités et des objets Guatemalen africains. La salle à manger peut accueillir facilement 8 personnes pour le dîner. Il ya porches spacieuses hors de chaque étage et la terrasse au large de la Grande chambre offre une vue à 180 degrés de balayage de haut en bas de la côte avec suffisamment d'espace à la fois pour un hamac et un coin salon. Détendez-vous, lisez, ou déjeuner tout en profitant de votre point de vue en bord de mer. Lorsque vous ne vous sentez pas envie de cuisiner, vous pouvez prendre un cinq à dix minutes à pied de la plage de deux des meilleurs restaurants de l'île - Mata Chica et Rojo / Azul Beach Bar. Ajouter la commodité de Mata Grande Épicerie directement derrière la propriété, un marché offrant un large éventail de dispositions et d'un café en plein air servant le déjeuner et le petit déjeuner. Une boisson froide ou un déjeuner savoureux sont 100 yards loin. Deux kayaks de mer sont fournis pour votre usage pendant votre séjour. Service de ménage est fourni tous les jours de votre séjour. Caye Villas fournit des gardiens sur place ainsi que la sécurité de nuit pour rendre votre séjour plus confortable! Calme Caye partage ses magnifiques jardins paysagers, une «piscine d'eau douce 20'x40 avec une grande terrasse dallée prélasser, un gardien sur place et de la sécurité de nuit avec quatre autres villas privées. Notre villa est nichée dans les paumes sur celui-ci en temps cocoteraie 4. 5 miles au nord de San Pedro. Fermez assez pour être à distance de frappe facile de la ville mais assez loin pour fournir l'isolement, la relaxation calme et privé. La route de la ville offre une collection variée de restaurants de funky à élégantes, retraites de yoga, bars de plage et des cafés. Salon de la piscine, pagayer dans un de nos kayaks pour le plus long récif dans l'hémisphère, ou demander notre direction pour organiser une excursion de plongée, un déjeuner à la plage, plongée, pêche, yoga, massage ou un voyage sur le continent pour une visite de ruines mayas, cave DROLE ou aventures tyrolienne. Que vous soyez une famille à la recherche de distractions de détente pour les enfants de tous âges, les couples courir une pause dans le soleil ou les voyageurs individuels qui cherchent une expérience de l'Amérique centrale une fois dans une vie, calme Caye est l'endroit de carte postale parfaite. Soyez aussi actif ou de détente que vous voulez être, calme Caye est l'endroit idéal pour appeler à la maison. Il ya trois salles de bains en-suite et une salle de bain au large de la Grande Salle. The property was amazing and has a great location with very friendly Staff. It was set up with everything we needed and more. From the moment we got there to the moment we left the staff on site were very friendly. accommodating, and always willing to help point us to restaurants or excursions. The view from the patio is second to none. The pool is well kept and most times we had it all to ourselves. There was a local vendor that stopped by every morning selling fresh tomalies and breakfast burritos. There are a few restaurants within walking distance so it was great to spend the days exploring and then walking along the beach at night to dinner. The dock right next to the property has a local tour guide who is more than happy to take you out for diving or snorkeling tours. Thank you very much for having us we had a great time. We had a wonderful time at Calm Caye Villas. Janice was super helpful with information on traveling to Belize and also trips to take while in Belize. The staff there made sure we had everything we needed and were all very friendly and helpful. The view of the ocean from the upper deck was amazing. We spent a lot of time out there just looking and listening to the ocean. Nice breeze as well. Pool was nice too just a little cool for me. Enjoyed going to the not so secret beach. A good time was had by all. House is very nice. Could use a little TLC, but I’m very picky. I read a lot before the trip about where to stay and it’s simple. If you want access to town, but not live in it (ug). Then this is a great location. The road to get here is like driving on the moon (craters) but it’s well worth being outside of San Pedro. House has everything you need and a gorgeous view from patio. Just yesterday we watched dolphins swimming just off shore. Kayaks were great for my girls (19 and 21). They went out to reef and snorkeled without any trouble. Damien (caretaker) was friendly and always helpful and honest. Plenty of options to eat within a reasonable distance. We were here for 10 days and only repeated a couple of times. I highly recommend this property. Initially we were visiting Belize to celebrate my husband's birthday, but then decided to include our adult children as well. The house was perfect for our party of 6. Plenty of room to gather together and plenty of space to retreat for rest or quiet time. The grounds are a tropical oasis! Damien, the caretaker, is kind, attentive and always wears a smile. He takes great care of the villas, the grounds AND the guests! Sandra, the housekeeper. is always smiling and does a great job of taking care of the house - including all of the sand that came in on our feet! Janice, the property manager could not have been more patient in answering our numerous questions prior to arriving and during our stay. She made sure that everything was perfect for our stay in Belize. Our diving/snorkeling outings with Sam and Joe (Scuba Daze Belize -right next door) were the best we have had (husband has dove in Australia, Truk, Mexico, Keys, Pacific NW, etc.) Our adventure inland with Clinton (Clinton Tours) was so impressive - his knowledge of the area made for a lifelong memory. The food and beauty was enjoyed by all! Yesterday, Same, Joe and Damien were all asking when we would be back - as I slept for the last night in Belize, my mind was already planning our return trip! We would definitely stay here again. Beautiful, quiet, but yet close enough on our golf carts! Thank you to all for making our trip so incredible! Thank you so much for your kind words. It was truly our pleasure hosting your family and knowing you enjoyed your stay enough to want to return tells us we delivered. We are very happy to have Damian and Sandra as part of our team and appreciate you acknowledging them. We hope your future is filled with many wonderful trips but look forward to hearing you will be returning to Caye Villas. 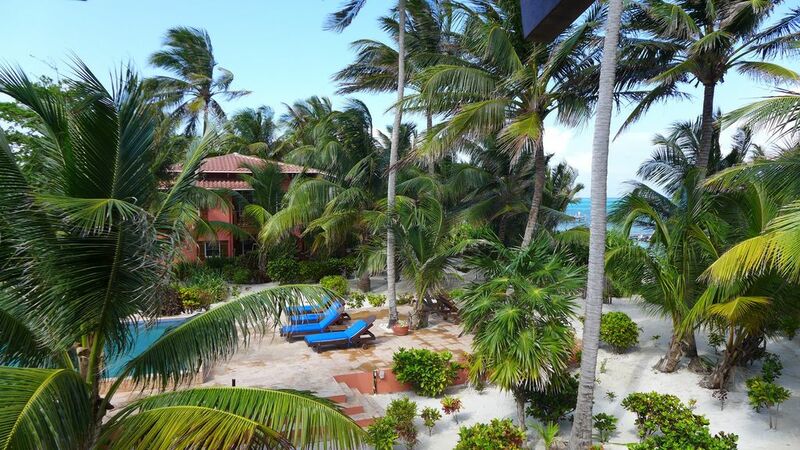 Our group recently spent 10 days at Calm Caye and were thoroughly pleased with our experience. We were four adults, a 17 year old boy and a 13 year old girl. The villa is spacious, clean, comfortable and well-stocked. It sits on a nicely landscaped property with four other villas. The landscaping shields Calm Caye from the other villas and gives a great sense of privacy. There is a lovely sea breeze on the porch. One of our favorite activities was just relaxing on the porch, looking out at the water and listening to the breeze rustle through the palm fronds. We also enjoyed the swimming pool, which was clean and quite refreshing. We found the property to be well-managed. David, the caretaker, lives on site and was always polite, friendly and available to help us without being intrusive. Janice, the property manager, was also very responsive to our questions and requests. For example, when I found myself in need of a pair of tweezers to remove a splinter, she had a pair, plus a bottle of alcohol, delivered to the villa within 10 minutes, and she added those items to the first aid kit that was already there. For those concerned about security, we always felt safe on the property. There is a private, night-time security guard who would watch over the property beginning at 6:00 p.m. We knew he was there because he would greet us when we would go out to the pool. But he was always discreet and remained in the background. We also felt safe exploring the Caye during the day. We found the locals to be very friendly and helpful. We never really went out at night because we were always worn out from our daytime activities. The highlight of the trip was our excursion up the beach road to the north to Tranquility Bay. I would highly recommend it. My only words of caution have to do with things that are out of the control of the property manager. First, for walkers and runners, be aware that a lot of the homes on the beach are guarded by loose dogs and exercise appropriate caution. Second, the entire Caribbean seems to experiencing a problem with seaweed. So, do a little research on that topic when planning the timing of your trip. Otherwise, go and enjoy yourselves! My two girlfriends and I stayed here for 6 nights and loved this house. There is plenty of space to spread out and also areas to congregate. The view from the deck is unmatched! There is air conditioning in each of the bedrooms and in the main living room. David, the caretaker was great and available when we needed him. Plenty of hot water and the beds were comfortable. This would be a great property for families as well. The property is a ways out of San Pedro (which we preferred) but a great golf cart ride with plenty to explore to and from. There are plenty of water activities to take advantage of and Janice, the property manager has plenty of suggestions for activities and restaurants. Go to "The Secret Beach"! Thank you Janice and David for a great girlfriend getaway! Calme Caye Villa est situé 4. 5 miles au nord de San Pedro Town dans la région de Mata Grande. La propriété est située face à la plage dans un groupe de cinq villas qui entourent une grande piscine. Mata Grande Épicerie est juste derrière la propriété et il ya quelques grandes stations au sein d'une courte distance de marche qui ont d'excellents restaurants et des cocktails sur la plage!